In early adolescence, many girls are fascinated by fashion design. They often start out by looking for silhouette drawings or templates of bodies that they can trace to sketch their own creations. A wide variety of images, resources and books specifically intended for fashion design drawing can easily be found on the web and in bookstores. The majority of these, however, show nothing but stereotyped bodies with proportions that are highly idealized and unreal. Because these templates or models have figures just like Barbie dolls, they end up creating false references which inevitably cause distorted perceptions of how one’s own body looks or should look. In 2011, a small group of volunteers got together to create a site with the goal of making non-stereotyped model templates available to trace for fashion design. The only models we’ve been able to find look more like “tall skeletal grasshoppers” than the real people we meet in the streets! No wonder our society produces so many anorexics and people frustrated for life that they never managed to become a Barbie! Our challenge: to offer a more realistic alternative to the distorted models with ridiculously long legs and tiny heads that are seen everywhere in the fashion design world and that create a false image of the female body. We want to present models inspired from real life, representing real people with all the originality and diversity that bodies come in. One year after launching this site, contact was made with Endangered Bodies, an initiative with shared goals, which led the Canadian team to organize the Every body is a model body campaign. More and more people, women and men, are dissatisfied with their bodies, which never seem to live up to their expectations. They constantly turn a critical eye towards certain aspects of their appearance or proportions which they’d like to change. Why? It’s inevitable that if most of the body types we see in medias are virtual and idealized, we end up disconnecting from reality and developing a false image of our own body. This initiative aims to offer new models, inspired and created from images of real people, by tracing their actual proportions. This in order to support more harmonious relationships with the reality of our bodies just the way they are, in the infinite diversity of human beings and not the way they have been deformed by inaccessible ideals. 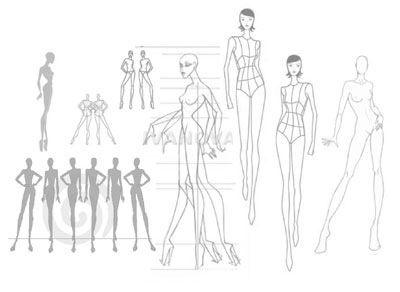 Fashion design schools and clothing designers are enthusiastically invited to use these silhouette-templates that we publish to create fashion that celebrates the richness of body diversity! Help us change the stereotyped norms the female body has been boxed into by organizing or participating in an Underwear photo-shoot, or send us a few photos of the silhouette of your own body. We will use them to draw new silhouette-templates for fashion design (photographs are not published). You will find more information on the page Photo-Shoot. This is a great thing that you are starting. I’ve been aware that the pictures on the pattern envelope were lying, but I thought it had more to do with how I had to correct the pattern to make the garment resemble the picture instead of a couch cover. It affects my opinions about their body-image issues. I have a feeling that the problems you are trying to correct aren’t just limited to women. Men also have a distorted sense of body image which can lead to them being violent against women, especially against women who objectify them. You see that a lot of male models are neither thin nor plus size. They’re always muscular and fashion is only good for you if you’re handsome and muscular. Not skinny nor thin. That is if you’re male, knowing men are limited to one body shape only. What an awesome campaign – thankfully the message is beginning to trickle through. I feel that in time we will see shape diversity just as much as we see cultural diversity!